Jon Schull, a research scientist at RIT and founder of e-NABLE, explains the function of the ‘RIT Arm,’ an inexpensive 3D-printed prosthetic arm designed and created by students at RIT. About 25 children with upper limb differences will be able to go to school this week with new 3D-printed prosthetic hands, as a result of the Prosthetists Meet 3D Printers conference held Sept. 28 at John Hopkins Hospital in Baltimore. RIT was among several co-sponsors of the daylong conference, which highlighted the work of e-NABLE, founded by RIT Research Scientist Jon Schull. Schull and seven Rochester Institute of Technology students joined more than 500 people at the event to help teach parents and their child with upper limb differences how to build their own 3D-printed prosthetic hands. The group also learned about the future of 3D-printed prostheses and showcased work at RIT in creating 3D-printed prosthetic arms. E-NABLE is an online volunteer community that is leading the way by developing inexpensive 3D-printed prostheses for children and adults in need. Schull created e-NABLE in 2013 to bring together 3D-printing hobbyists and professionals with people in need of prostheses. While a custom prosthetic devices can cost more than $10,000, a mechanical 3D-printed hand can be made using free designs available online and about $50 worth of materials. Schull currently works along with RIT students to improve prosthetic designs and donate hands to local residents in need. In addition to presentations by medical and industry leaders and innovators, policy analysts discussed the vital role that 3D printing can play in delivering affordable healthcare. By the end of the day, the e-NABLE group had built more than 100 hands. Many will be donated to children in need across the country and in Haiti. 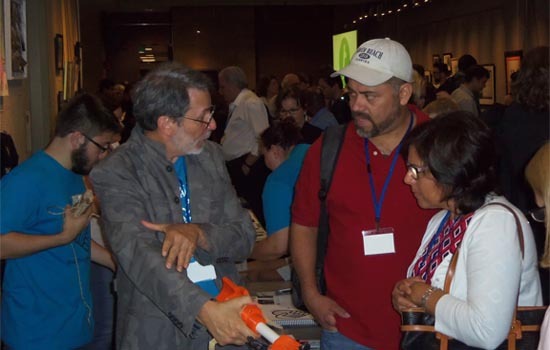 Other sponsors for the conference included Johns Hopkins University, manufacturers of open-source 3D printers Ultimaker, the prosthetics firm Dankmeyer Inc., the Mercatus Center of George Mason University and the University of Wisconsin-Milwaukee.